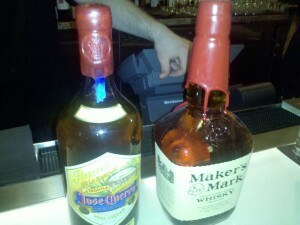 Maker’s Mark Bourbon Wins Over Jose Cuervo Tequila, do you think they look the same? Maker’s Mark tells BourbonBlog.com that they have won a judgment confirming that its distinctive and famous free-form red wax seal coating is a well-known and valid trademark. The lawsuit was triggered by a special bottling of Jose Cuervo Anejo Tequila Reserva De La Familia being dipped in a red wax. BourbonBlog.com recently took at look at (and a drink from) both while dining at Mandalay Bay’s Stripsteak in Las Vegas, see photos. They tasted quite different to us, how different do you think they look? Which would you rather drink right now? Please post your comments and continue reading. The April 2, 2010, opinion by Federal Judge John G. Heyburn II, of the United States District Court for the Western District of Kentucky, prohibits Jose Cuervo International, Inc., its affiliates and Cuervo’s United States distributor Diageo North America from the use of a dripping red wax seal on any Cuervo tequila product. 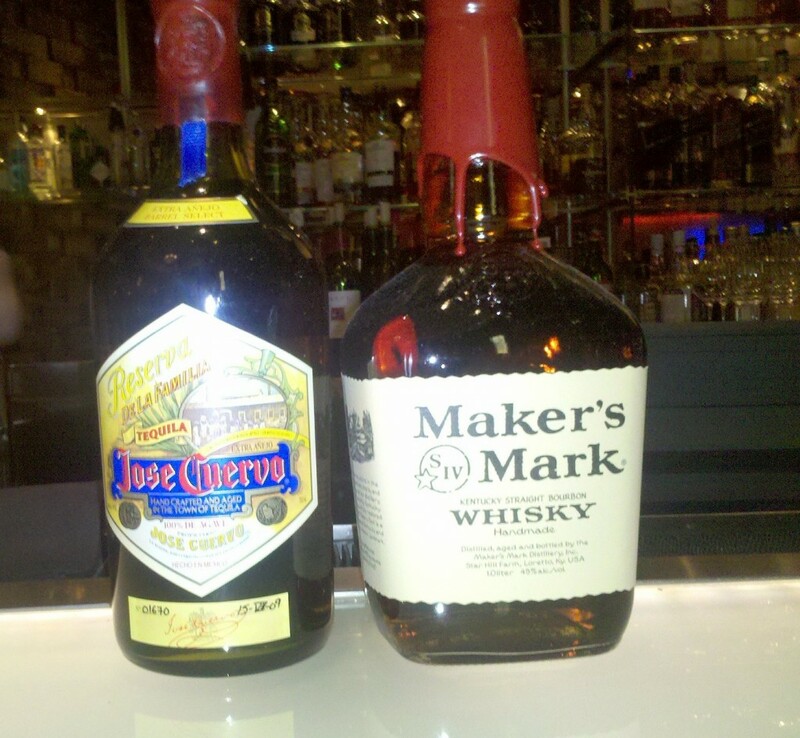 In issuing an injunction against future use of any infringing trade dress by Cuervo or its distributor Diageo, Judge Heyburn found that consumers and others might be confused about the origin of Cuervo products bearing a device similar to the iconic red wax seal of Maker’s Mark – even though the Cuervo product in question is a tequila, while Maker’s Mark is a Bourbon whisky – given that the red wax seal is an “extremely strong mark” associated with Maker’s Mark Bourbon. Maker’s Mark was represented in this litigation by a team from the law firm of Kenyon & Kenyon of Washington, D.C., led by Edward T. Colbert. BourbonBlog.com is contacting Diageo for their comments. This seems like a bitchy move on Maker’s Mark part, don’t you think? Hey, I dig Maker’s Mark. It’s a fine whiskey, but Jose Cuervo Reserva de la Familia is one of the best tequilas in the world. And I believe they’ve been bottling it with the red wax since the first year they released it in 1995 or so. This seems like a pretty silly lawsuit to me. A trademark is worthless unless you challenge every single case against it. They had to sue in order to keep their trademark & brand intact. 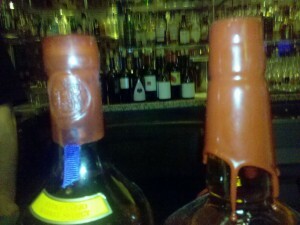 I know, on the surface, it seems like Maker’s Mark is being petty and trying to make something of nothing. However, in issues of trademark you really are legally *obligated* to pursue any infringement that comes to your attention. Of course they look different and there are other differences. It’s like “Kleenex” – the bathroom tissue becoming a generic word instead of a name brand. If you don’t protect the mark you own you end up running the legal risk of losing that mark. If anything, a judgment to simply stop using the dipped, red wax shows restraint on Maker’s Mark part and demonstrates they were really doing what the law says they must – attempt to protect it or risk losing it. Had they gone after extensive damages it might suggest they were being petty and/or greedy but a judgment to stop is pretty much the least amount of force they have to legally exert to protect themselves. That way, if someone else comes along and says “Maker’s Mark can’t sue ME for using red wax on my bourbon bottles – see – they let Jose Cuervo do it” …they won’t have a case. Maker’s Mark did the least amount possible to stay on the legal side of protecting their trademark and appear to have left it there. I seriously doubt anybody (even at Maker’s Mark) thought of making this personal against Jose Cuervo. I agree with Boog. I would add that a suit of this magnitude was costly to both parties and that while sometimes the issue is which party has the bigger huevos, it usually is too costly to proceed based solely upon pride. One other fact in the case: Cuervo stopped selling Cuervo bottles with a red wax seal back in 2004 (and from what I can tell, the seal appears less ‘drippy’ now too). Considering this ruling, I would love to own one of those red seal bottles of Cuervo!